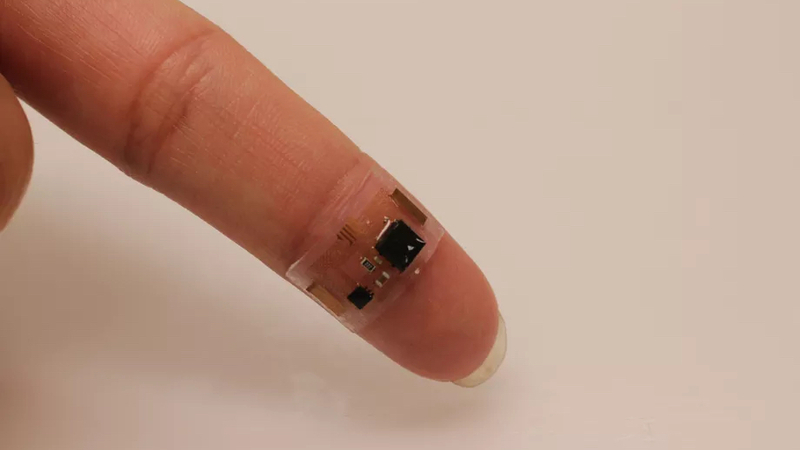 A prototype stick-on sensor that can listen in to what's happening inside your body is being developed by researchers at the University of Illinois and the University of Colorado Boulder. The incredible 2mm thick wearable is flexible, stretchable and uses a very sensitive accelerometer to detect sound waves in the body and an electrode to measure electrical signals. So, it can listen to your heartbeat, throat vibrations, snoring and even blood flow and muscle activity. It's isn't wireless yet but the plan is to add Bluetooth functionality to the temp tat as more testing and research is completed. So far the stick-on stethoscope has been tested on eight elderly people with heart conditions as well as heart pumps outside the body and er, chopped up chicken breasts. Tech like this could be key to the NHS and other health providers' plans to get doctors remote monitoring patients via affordable and easy to use devices. It could also help in research studies as participants won't need to remember to wear it and it won't impact their routine. Outside healthcare, stick-on electronics may be one answer to solving the $1 million Women's Safety X Prize, for instance, could play a part in the future of dating plus MIT & Microsoft Research are experimenting with NFC tags, controlling gadgets and digital ID.